Someone noticed how much I’ve been tweeting about sweets/desserts/pastries this past few weeks and decided to satisfy my never-ending craving for them! 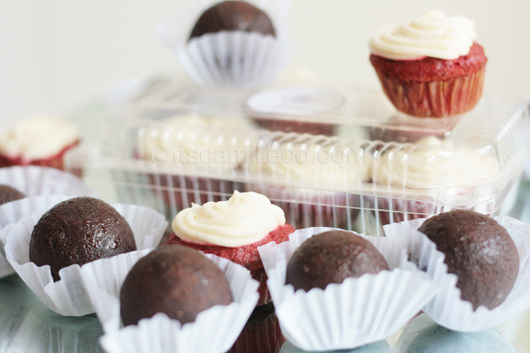 Presenting, banana cake pops and red velvet cupcakes from new pastry shop, Nikola Pastries! I literally finished all these in one sitting. NO JOKE. Dessert has always been my favorite part of the meal so you can just imagine how much I enjoyed eating these. The banana cake pops came fresh from the freezer. Just one bite, and you’ll immediately get a taste of its moist, rich flavor. Imagine, cold banana cakes/bread wrapped in yummy chocolate. Yummmm! 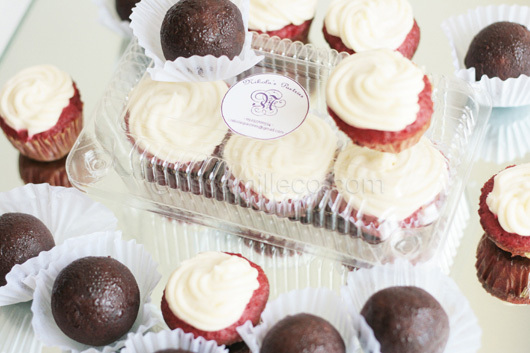 The red velvet cupcakes didn’t disappoint either. Red velvet is currently my favorite cupcake flavor so it really doesn’t take much to satisfy me. HELLOOOOOO. Cream cheese frosting on top of a cupcake, how can you go wrong??? For inquiries, visit Nikola Pastries’ Facebook Page or you can email them at nikolaspastries@gmail.com.